Tonsuring of Dustin (Joseph) Crosby as a Reader by Archbishop Mark. 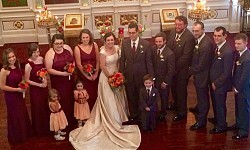 May God grant Reader Joseph and his family Many Happy & Blessed Years! On Sunday, December 17, 2017, the choir and church school sang carols at the Birches care facility in Newtown. Merry Christmas to all! On Sunday, December 17, 2017, we welcomed Fr. Chad Hatfield, President and COO of St. Vladimir’s Orthodox Theological Seminary in New York to serve, preach and inform us about St. Vladimir’s and its role in the life of the Church. We are grateful to Fr. Chad for being with us and sharing with us the work of the Seminary. On Sunday, Nov. 19, the St. Mark's Church School packed & shipped 50 boxes for children in need through Operation Christmas Child. Thank you to the kids, parents & generous parishioners who donated again this year. God bless! 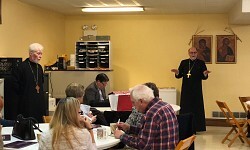 November 4, 2017: Priest David Mezynski hosted an advent retreat entitled "Wisdom from the Desert: Life Lessons for Today from the Holy Harlots and Desert Fathers." So many great discussions that he didn't get through all that he had planned, so Father David will be back for Part 2! Fr. David serves as the Associate Dean of Students at St. Vladimir's Seminary. The Greater Philadelphia Orthodox Clergy Brotherhood celebrated the Great Blessing of the Waters at the Schuylkill River on Boathouse Row on Sunday, Jan. 22, 2017. On Sunday, Nov. 13, 2016, our Church School packed shoe boxes for this year's Operation Christmas Child. They packed 88 boxes, almost twice as many as last year! Thank you to all the parents & teachers who helped our kids do such great work! On Sunday, May 1, our parish celebrated the Feast of Feasts, Great and Holy Pascha, the Resurrection of Our Lord, God, and Savior, Jesus Christ. This year, we were blessed to welcome our diocesan bishop, His Eminence, Archbishop MARK. His Eminence led a Hierarchical Divine Liturgy following the Paschal Nocturns and Matins. After Divine Liturgy, His Eminence blessed the Paschal Baskets followed immeadiately by the Agape Meal. This is the day which the Lord has made. Let us rejoice, and be glad in it! 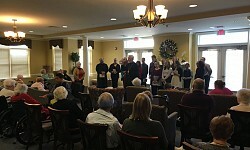 On Sunday, December 20, faithful of St. Mark's gathered at The Birches nursing home in Newtown to sings Christmas carols for the residents. 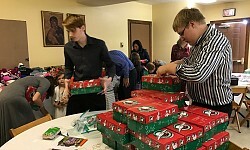 On Sunday, November 22, the Church School folded and packaged shoe boxes for this year's Operation Christmas Child. We packaged 41 boxes this year from our last year record of 30. Thank you to the teachers and children of the Church School who worked on the project and to those in the parish who supported it. On Sunday, November 15, the Sunday of the Good Samaritan, we welcomed Tony Pantazopoulos of IOCC who shared with us the work of IOCC throughout the world, especially in aiding the staggering number of refugees in and from Syria. IOCC is a pan Orthodox effort supported by all Orthodox jurisdictions in North America and is a highly regarded non profit which spends little on administration and is gifted in multiplying the sacrificial seeds sown by donors. We are delighted to have welcome Tony here. 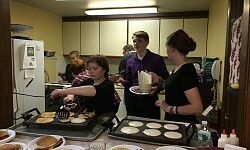 On Sunday, November 8, 2015, the Church School held a Pancake Breakfast Fundraiser. The proceeds will help this year's Operation Christmas Child charity project. 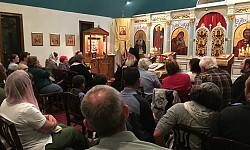 On Thursday, October 22, a flock of faithful gathered here at St. Mark's to see Abbot Tryphon of the All-Merciful Savior Russian Orthodox Monastery in Vashon Island, WA to lecture on "Engaging the Culture", a lecture on Orthodox living. "The Arrow Prayer" (blog post about Fr. Tryphon's visit to us). On September 13-14, faithful of St. Mark's celebrated the great feast of the Exalation of the Holy Most Precious Cross. On Sunday, September 13, 2015, our children and teachers of St. Mark's Church School gathered for blessing of their new year. On Sunday, September 6, 2015, Max Kaplan and Marina Moser were joined in Holy Matrimony here at St. Mark's. 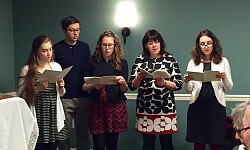 Following the service, the reception was held at the Northampton Valley Country Club. May God grant Max and Marina and their familes many years! On Sunday, June 21, our parish celebrated Fathers Day by recognizing all our living and departed fathers, grandfathers, and godfathers. It was the Ravetto family's last Sunday here at St. Mark's as they're preparing to start a new adventure in Germany. They will be missed. May God grant the Ravetto family, our fathers, grandfathers, and godfathers many years! Grant rest eternal in blessed repose O Lord, unto thy departed fathers, grandfathers, and godfathers who have fallen asleep, and make their memory to be eternal! 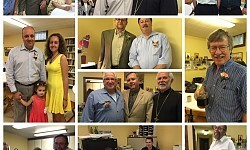 On June 13-14, His Eminence, Archbishop MARK made his annual archpastoral visit to our parish. On Saturday, His Emenince met with all parish groups: Parish Council, Sistherhood, Choir, and Church School. On Sunday, His Eminence led the service of Divine Liturgy. Following Divine Liturgy, couples celebrating 10 to 15 years of marriage were given blessings from His Eminence, and the Ravetto family received the Gramota in recognition for service to the parish. May God grant all of them many blessed years! On Saturday, June 13, following Great Vespers, childern, teachers, and parents of the Church School met at the rectory for our monthly Church School Movie Night. His Eminence, Archbishop MARK met with the Church School before the movie and pizza started. On Sunday, June 14, Teens of the Church School had an impromptu movie night at the Regal UA Artists Movie Theater in Oxford Valley Mall to see new movie, Jurassic World in 3D. 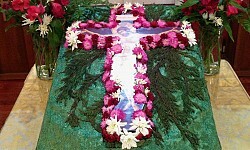 On Sunday, May 10, St. Mark's celebrated Mothers' Day. May God grant all mothers, grandmothers, and godmothers many years! Grant rest eternal in blessed repose O Lord, unto the thy servants, the departed mothers, grandmothers, and godmothers, and make their memory to be eternal! 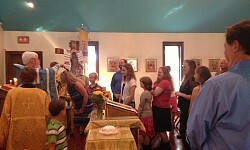 On Sunday, May 3, Anna Crosby, infant daughter of Dustin and Gillian Crosby, was baptized into the Holy Orthodox Church. Christopher and Jennifer Seremenak are the godparents. On Saturday, April 25, parishoners of St. Mark's volunteered for the spring parish work day where we clean up the mess on the property from winter. Thank you to all who helped. On Monday, April 13, parishoners of St. Mark's celebrated Bright Monday with the Divine Liturgy and Procession with the 4 Gospels. Following Divine Liturgy, parishoners traveled to the Corner Bakery Cafe in Newtown for brunch. After brunch, Church School made a field trip to the Philadelphia Zoo. On Sunday, April 12, faithful gathered at St. Mark's to celebrate the Feast of Feasts, Great and Holy Pascha (The Resurrection of Our Lord, God, and Savior Jesus Christ). The celebration began with Nocturns 30 minutes before midnight. Paschal Matins began with the procession around church. 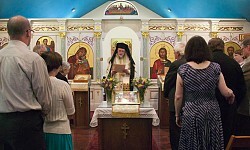 Following Matins, Divine Liturgy of St. John Chrysostom was celebrated. After Liturgy, the faithful gathered at the church hall for the Blessing of the Baskets and meal. On Sunday, April 5, 2015, the faithful of St. Mark's celebrated the Feast of the Entrance of the Lord into Jerusalem (Palm Sunday). 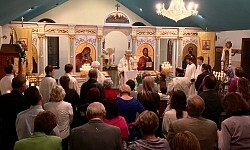 The feast was celebrated with Vigil on the eve of the feast and Divine Liturgy on Sunday morning. 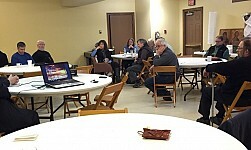 On Saturday, March 21, 2015, our parish held its annual Lenten Retreat. This year's speaker was Archpriest Alexander Golubuv of St. Nicholas Russian Orthodox Cathedral in New York City, on the topic "Genesis Revisited". On Sunday, March 15, 2015, our parish celebrated the Third Sunday of Great Lent, the Sunday of the Holy Cross. On Sunday, March 1, 2015, our parish the First Sunday of Great Lent, the Sunday of Orthodoxy. 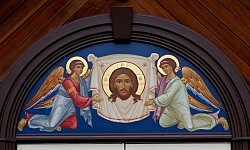 "Great Lent is an icon workshop. We are the defaced, chipped, cracked, soot-covered icons whom the Iconographer wishes to restore." 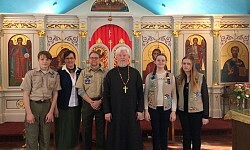 On Sunday, February 8 was National Scout Sunday was designated by the Assembly of Canonical Orthodox Bishops of the Americas as Orthodox Scout Sunday. On Sunday, February 8, the Prodigal Son, Rector, Fr. Martin Browne installed the Parish Council of 2014-2015. May God grant them many years. 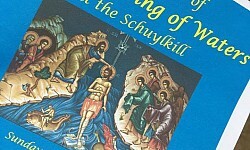 On Tuesday, January 6, 2015, our parish celebrated the Feast of the Holy Theophany of Our Lord, God, and Savior, Jesus Christ. 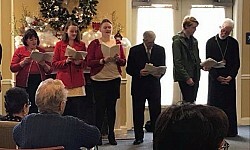 On Friday, December 26, 2014, St. Mark's Choir sang Christmas psalms and music for the senior citizens living at the Birches in Newtown nursing home. On December 24-25, our parish celebrated the Great Feast of the Nativity of Our Lord, God, and Savior, Jesus Christ. On Christmas eve morning, Royal Hours followed by Vesperal Liturgy of St. Basil was celebrated. 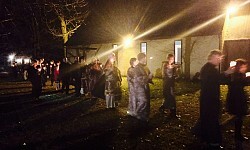 On Christmas eve night, faithful gathered at the church hall to celebrate our Holy Supper. Great Compline and Matins followed. 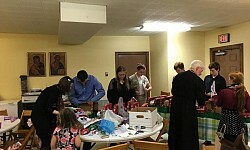 On Christmas morning, Divine Liturgy was celebrated followed by Coffee Hour. 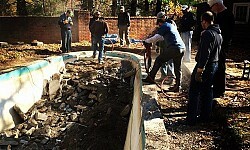 On Saturday, November 8, following Divine Liturgy for the Feast of the Archangel Michael the Other Bodiless Hosts, volunteers of our parish began a new project, Pool Demolition. Two jackhammers and other assorted tools in the hands of a dedicated group of parishioners and friends completed the first phase of this large and difficult project. We look forward to Phase Two. 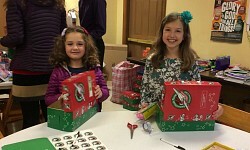 On Sunday, November 2, 2014, The Children of the Sunday Church School packed boxes for Operation Christmas Child. The children packed 30 boxes. On Sunday, September 14, the faithful of St. Mark's gathered to celebrate the second of the Twelve Great Feasts of the Church Year, the Feast of the Exaltation of the Holy Most Precious Cross. The feast was celebrated with Vigil on the eve of the feast (Saturday evening), and Divine Liturgy was celebrated on Sunday morning. On Sunday, September 7, 2014, Rector, Fr. 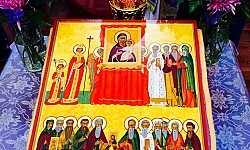 Martin Browne blessed new icons that where painted by Joseph Brown and also the children and teachers of the Sunday Church School for the beginning of the new year. 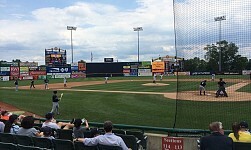 On Sunday, June 22, parishoners from St. Mark's joined parishoners from the Mother of God, Joy of All Sorrow Mission in Princeton, NJ for a baseball game at the Arm & Hammer Park, home of the Trenton Thunder. During the game, parishoner, David caught a foul ball, well sort of. Sadly, the Thunders lost 7-2, but everbody still had a good time. 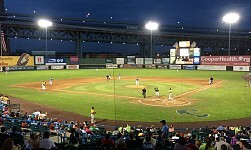 On Friday, June 14, clergy and layity of the Philadelphia Deanery gathered at the Campbell Stadium in Camden, NJ for the Camden Riversharks game against the York Revolution. Sadly the Riversharks lost with 7-3, but everybody still had a great time. Following the game, fireworks lit up the sky. On Sunday, June 8, 2014, our parish of St. Mark's celebrated the Great and Holy Feast of Pentecost. On the weekend of May 31-June 1, His Grace, Bishop MARK made his first pastoral visit to our parish as Bishop of Philadelphia and Eastern Pennsylvania. His Grace attended Great Vespers on Saturday night and served Divine Liturgy on Sunday morning. During Divine Liturgy, Rector, Fr. Martin Browne was awarded with the Gold Cross for his dedicated service to the diocese. His Grace also recognized our parish couples who are celebrating major wedding anniversaries from 60-20 years. 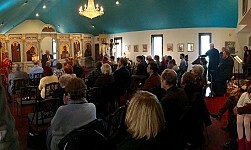 Following Liturgy, a luncheon was held in the church hall. On Monday, St. Mark's hosted the Diocesan Council for its regularly scheduled meeting, the first with our newly installed hierarch. On Bright Monday, April 21, following Divine Liturgy and breakfast, 27 of our parishoners took a trip to Adventure Aquarium in Camden, NJ. It was a beatiful day and everyone enjoyed themselves. We're expecting more trips like this in the future. 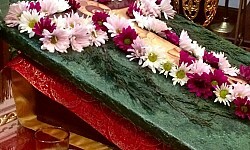 On April 14-April 20, our parish celebrated Holy Week and Great Holy Pascha. This week was very joyous and had a massive adentence for the services. On Great and Holy Tuesday, April 15, His Grace, Bishop Mark visited our parish of St. Mark's and celebrated Presanctified Liturgy. His Grace made some remarks on Holy Week at the end of the service. On Sunday, February 23, 2014, Meatfare Sunday, Rector, Fr. Martin Browne installed the new Parish Council of 2013-2014. May God grant them many years. 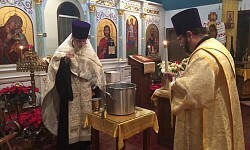 On Monday, January 6, 2014, parishoners of St. Mark's gathered to celebrate the joyous feast of the Lord's Theophany with the Great Vespers, Divine Liturgy, and the Great Blessing of the Waters. On Sunday, December 29, His Beatitude, Metropolitan Tikhon attended Divine Liturgy while on his way home from Washington D.C. Following Divine Liturgy, His Beatitude also participated in a memborable panikhida for Pierre Djockic on the occasion of his 40th Day, and for Sam Mervis on the occasion of the First Anniversary of his repose. May God grant His Beatitude, Metropolitan Tikhon many years! May Pierre's and Sam's memory be eternal! On Wednesday, December 25, parishoners of St. Mark's Orthodox Church gathered to celebrate the Nativity of Our Lord, God, and Savior, Jesus Christ. We began the celebration with the Royal Hours and Vesperal Divine Liturgy on Christmas Eve morning. Then in the evening, we held our Annual Nativity Holy Supper, and then continued with the Great Compline and Matins. Finally, on Christmas morning, we celebrated the Divine Liturgy of St. John Chrysostom for the feast. Many faithful gathered for the feast to celebrate. 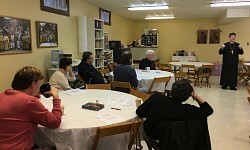 On Saturday, December 7, 2013, The Parish Advent Retreat was held. The retreat was led by Fr. Alexander Golubov of St. Nicholas Patriarchical Cathedral in New York City. Many faithful attented. 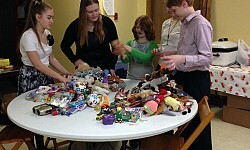 The Sunday School children helped put together a chairty event called "Operation Christmas Child". They asked for donations of hats, scarves, gloves, stuffed animals, toys, candy, and toiletries. These are being sent to the needy children in war zones like Syria. Thanks to all who helped and donated to make this possible. 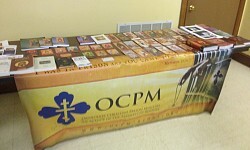 On Sunday, November 3, Chaplain Patrick Tutella, executive director, and his wife visited St. Mark's to talk about the Orthodox Christian Prison Ministry (OCPM). Peter gave the homily on the prison ministry. 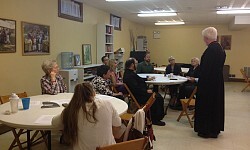 Following Divine Liturgy, everyone gathered downstairs for coffee hour and talked with Peter and his wife about the ministry. 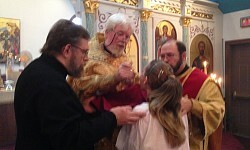 On Saturday, November 2, Ashley Mary Hewitt was baptized into the Orthodox Church. On Sunday October 6th, St. Mark's recognized Archpriest Michael Sekela for his fortieth anniversary of ordination to the Holy Priesthood. Fr. Michael was ordained on October 14, 1973. Additionally, he and Mat. Teresa were recognized for their 48th Wedding Anniversary which falls on October 16th. And to round off the family celebration, their grandson Matthew was included in the Many Years offered to his grandparents as he celebrated his birthday on October 9th. Congratulatory letters for both occasions were presented to the Sekela's from His Grace, Bishop Mark and a reception in their honor in the Church Hall was held following the Divine Liturgy. Following a ministry that saw him serve in parishes throughout the U.S. and in the military, Fr. Michael retired and is attached to St. Mark's where his daughter Larissa, son-in-law Chuck and grandsons, Luke and Matthew are members. May God Grant Fr. Michael and Mat. Teresa Many Happy and Blessed Years! 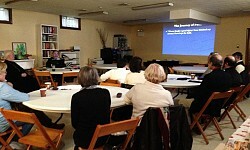 Our parish of St. Mark's Orthodox Church is currently holding the Parish Revitalization Health Inventory. This program continues every last sunday of the month following the coffee hour. On September 14-15, St. Mark's Orthodox Church celebrated the Feast of the Exaltation of the Precious and Lifegiving Cross. On Friday evening, the Festal Vigil for the feast was celebrated, with Festal Divine Liturgy on Saturday morning. On Sunday, September 8, 2013, on the feast of the Nativity of the Our Holy Most Lady, Theotokos and Ever Virgin Mary, our children and teachers of the Church School began their new academic year. 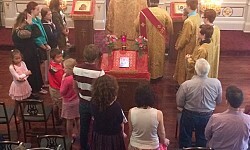 On Sunday, June 23, parishoners of St. Mark's Orthodox Church celebrated the Great and Holy Feast of Pentecost. 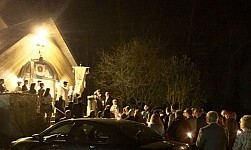 Vigil was celebrated on eve of Pentecost. 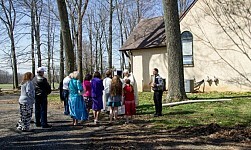 Divine Liturgy was celebrated on Sunday morning. Kneeling Vespers followed Divine Liturgy. On Sunday, June 16, 2013, our parish welcomed His Grace, Bishop MARK, Administrator of the Diocese of Eastern Pennsylvania for his first pastoral visit. During Divine Liturgy, His Grace awarded Acting Rector, Fr. Martin Browne with the kamilavka for his service to the church. His Grace also blessed church renovations. Couples Mryon and Linette Sedor and Ken and Dorothy Martiak were recognized for their 40th wedding anniversaries. Following the service, a luncheon was held in the church hall. This day was special because it was Fathers Day and we were blessed to have our spiritual father of our diocese. 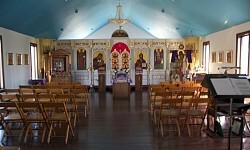 Renovations were made at our parish of St. Mark's Orthodox Church. Wood work around the church was cleaned and restored, A new icon was installed over the church front door, and new blinds were put in the altar. 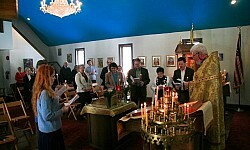 On Monday, May 6, our parish of St. Mark's Orthodox Church celebrated Bright Monday. The celebration began with Divine Liturgy and concluded with a processions with 4 gospel readings. On Sunday, May 5, our parish of St. Mark's Orthodox Church celebrated the Feast of Feasts, the Resurrection of the Lord, God, and Savior, Jesus Christ. We began the celebration with the Nocturns, Matins, Hours, and Divine Liturgy. The Blessing of the Baskets and Agape Meal followed. This is the day which the Lord has made, let us rejoice and be glad in it. 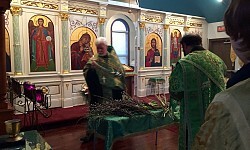 On April 29-May 4, our parish of St. Mark's Orthodox Church celebrated Holy Week. For the first three days whe had Bridegroom Matins and Presanctified Liturgy. On Holy Thursday, we celebrated the Vesperal Divine Liturgy and the Matins of Holy Friday with 12 Passion Gospels. On Holy Friday, we celebrated the Royal Hours, Vespers with Placing of the Shroud, and Matins of Holy Saturday with Lamentations. And on Holy Saturday, the Vesperal Divine Liturgy of St. Basil. We are blessed new carpet and new flooring installed at St. Mark's. Thanks to everyone who donated to make this possible. 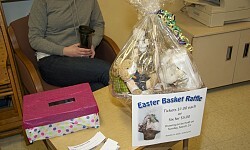 On March 23-24, the our parish held the Easter Food and Bake Sale. We sold pierogies, kielbasi, babka, nut and poppy seed rolls, and more. 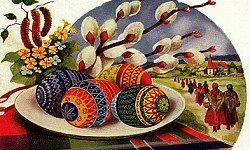 On Sunday, Artisan Christa Bain sold her collection of pysanky eggs. This was an incredible event. 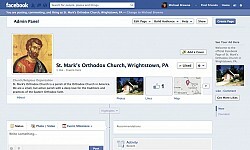 On Friday, February 22, 2013, the official Facebook Page of our parish was launched. 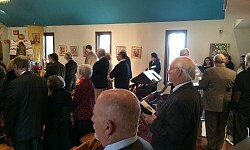 On Sunday, January 27, 2013, our Parish Council of 2012-2013 was installed. On Sunday, January 27, 2013, His Beatitude, Metropolitan TIKHON was enthroned as Metropolitan of All America and Canada at St. Nicholas Cathedral in Washington D.C.
On December 24-25, 2012, parishoners of St. Mark's Orthodox Church celebrated the Feast of the Nativity of the Lord, God, and Savior, Jesus Christ. We began the celebration with the Royal Hours and Vesperal Divine Liturgy on Monday morning. Then on Monday evening, our annual Nativity Holy Supper and the Great Compline and Matins. 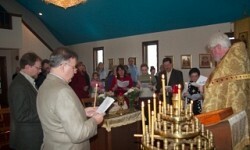 On Tuesday morning, everyone gathered for the Festal Divine Liturgy. On Sunday, December 16, 2012, our parish welcomed Priest Raymond Martin Browne and his family. Fr. Martin is currently serving as acting rector. May God grant Fr. Martin and his family many years.